THE Association of Mineworkers & Construction Union (AMCU) called out members at its gold, coal and platinum mines on strike to protest the possible retrenchment of about 6,700 workers at the gold mines of Sibanye-Stillwater, said Bloomberg News citing AMCU’s president, Joseph Mathunjwa. “We control these mines,” Mathunjwa told reporters at a press conference in Johannesburg today. He declined to say when the secondary strike will start, but said it would include members at companies such as AngloGold Ashanti and Harmony Gold as well as Lonmin and Impala Platinum. 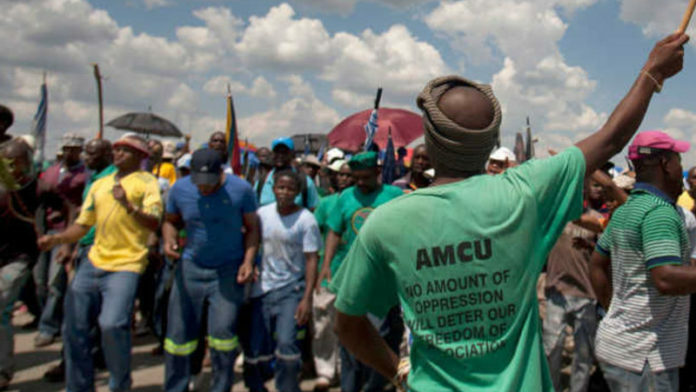 AMCU, the biggest labour union in the nation’s platinum-mining belt, is escalating threats in a standoff with Sibanye CEO, Neal Froneman, who announced last week that the company may cut jobs at its Driefontein and Beatrix mines, said Bloomberg News. AMCU started a strike over wages at the company’s gold mines in November, and held a stay-away at Sibanye’s platinum operations last month. Mathunjwa said that Sibanye was targeting job cuts at AMCU and called for investors to pull funds from the company. What an utterly joke to make these threats. Still the government is nowhere to be seen while this union attempts to bring the mining in SA to a standstill. What does Mathunjwa want next….President of South Africa? Maybe its time for CR to enter to stop this lunatic? The minister of mines is where?? Just reading the Fin24 article also, who does this union think they are? Even threatening the government and all mine bosses. Since when is this a legal way of striking? Froneman vs Amcu….AND THE WINNER IS….NUM!!!! This strike will lead to the defeat of Amcu. Froneman is not going to settle. Amcu will loose this battle. They might revert to intimidation and violence but it will not help. They cannot and will not win. 100% agree! Neal might just go down in history as the SA Mining Entreperneur who broke the strange hold of unions on the industry. Our very own Maggie Thatcher! The winners would be ALL stakeholders as mines would invest and re-open and provide jobs. Workers could be remunerated on a basis of PRODUCTIVITY and make more money themselves and not have to pay FAT BLOATED union bosses huge fees. GO FOR IT NEAL!!! Agreed, Unions and socialism (read entitlement) are the biggest cancers of our age. I robs current and future generations of a good life and a prosperous future for their children.